An Israeli military court on Tuesday sentenced a Palestinian to two life terms and almost another 60 years in prison for the killing of a Jewish settler and his infant son, an army spokesman said. The spokesman said Waal al-Araja was earlier this month found guilty of murdering Israeli-American Asher Palmer, 25, and 18-month-old son Yonatan when he hurled stones at Palmer's vehicle travelling near the West Bank town of Hebron in September 2011. 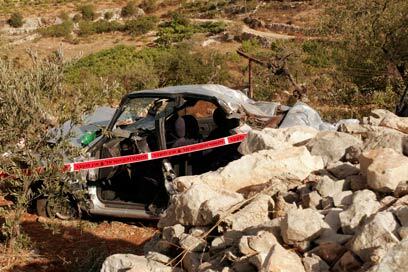 Palmer, who lived in the Kiryat Arba settlement near Hebron, lost control of the car as a result and the two crashed to their death. Police had initially ruled out an attack against the car. On the day of the crash, Palestinians had hurled stones at settlers' vehicles, particularly in the region where the settler and the child were killed. See all talkbacks "Palestinian stone-thrower gets life for killings "